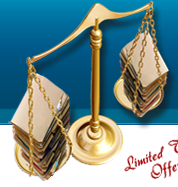 Your complete file and folder comparison and synchronization solution. FolderMatch 3.7.3 was available as a giveaway on February 20, 2018! 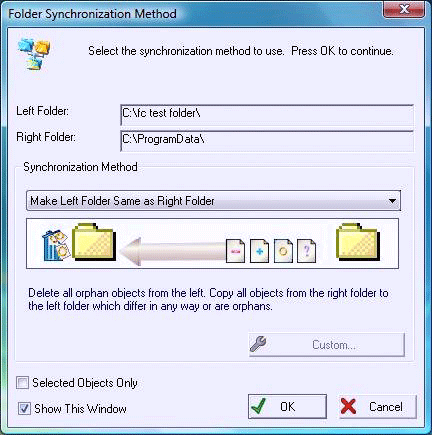 all files are retained.Easily, quickly, and reliably compare and synchronize two folders, two drives, or two computers. 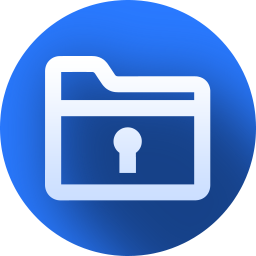 Safely backup photos, emails, contacts, and documents. See the exact text differences between two text files, Excel spreadsheets, Microsoft Word, Adobe PDF, or Rich Text (RTF) documents. 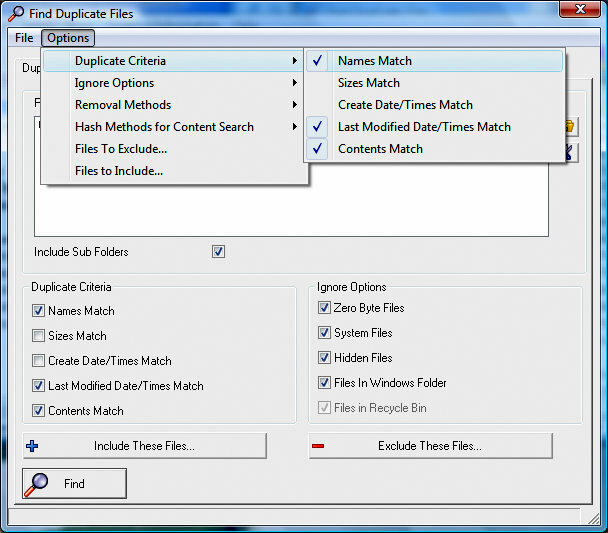 Find and remove all duplicate files on your machine. Even if their names are different! Rename multiple files at one time and Much more! How would you improve FolderMatch 3.7.3? For only $21.99 you can upgrade a single FolderMatch home-use license to allow you to install FolderMatch on all the computers in your home. 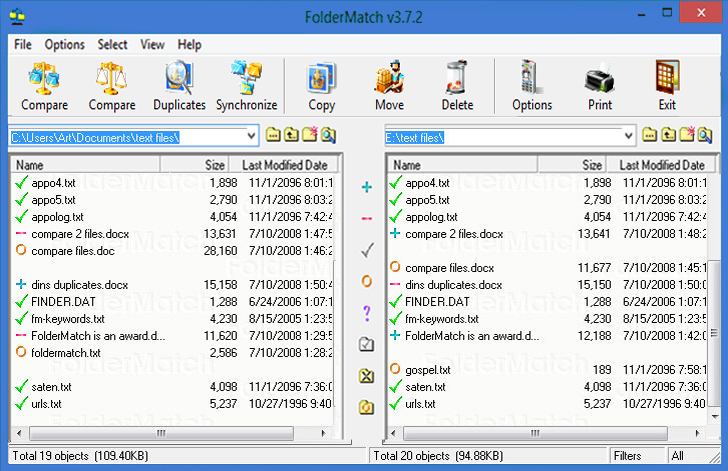 For only $39.95per license you can receive free upgrades for the lifetime of FolderMatch. For a one-time fee that is far less than what you would ordinarily pay for all the upgrades over the lifetime of FolderMatch, we will provide you with free upgrades for the life of the product. With Lifetime Upgrade Assurance, you will always be on the most recent version of the software for the lowest total cost of ownership. Result from 68 antivirus softwares: It's clean! I see several comments here regarding FolderMatch possibly containing a virus. As the lead developer of the software I'd like to make a post about this. I understand your hesitation/concern. In this day and age you have to be very careful about what you install on your computer. Let me assure you that we are a reputable software dealer. We've been in this business since the beginning of the try-before-you-buy days. We've been highly awarded by fellow colleagues and software organizations for the quality of our software. Sadly, all of that matters not if one anti-virus software incorrectly flags your software as containing a virus. Our software is 100% free from viruses, adware, or spyware. False positive virus reports from anti-virus software are very real and very common. Anti-virus software is not foolproof. Any reports coming from your anti-virus software stating that FolderMatch contains a virus are incorrect. Don't take my word for it however, run our installer through the VirusTotal.com website and allow it to verify this for you. The admins of Giveaway Of The Day have already done so before offering this to you. I hope that this reply from the person who coded much of the software alleviates any hesitation/concerns you might have. I hope that this response from the developer of the software will assuage any concerns anyone reading this might have. I see several comments here regarding FolderMatch possibly containing a virus. As the lead developer of the software I'd like to make a post about this. I understand your hesitation/concern. In this day and age you have to be very careful about what you install on your computer. Let me assure you that we are a reputable software dealer. We've been in this business since the beginning of the try-before-you-buy days. We've been highly awarded by fellow colleagues and software organizations for the quality of our software. Sadly, all of that matters not if one anti-virus software incorrectly flags your software as containing a virus. Our software is 100% free from viruses, adware, or spyware. False positive virus reports from anti-virus software are very real and very common. Anti-virus software is not foolproof. 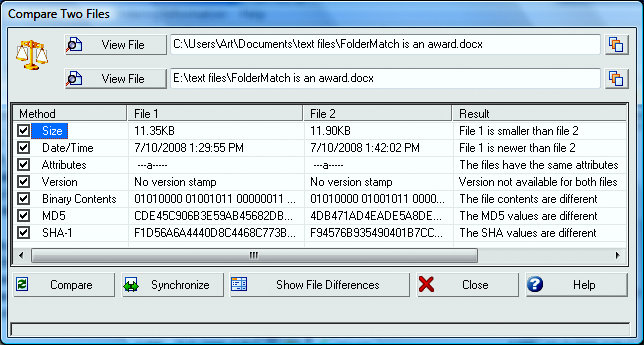 Any reports coming from your anti-virus software stating that FolderMatch contains a virus are incorrect. Don't take my word for it however, run our installer through the VirusTotal.com website and allow it to verify this for you. The admins of Giveaway Of The Day have already done so before offering this to you. I hope that this reply from the person who coded much of the software alleviates any hesitation/concerns you might have. Art Araya Lead Developer - FolderMatch Salty Brine Software I hope that this response from the developer of the software will assuage any concerns anyone reading this might have. Perfect timing for this. Just got a 6TB external drive and was getting ready to start copying and organizing things from my other drives onto this one. If I'm reading things correctly, it sounds like I'll be able to use this program to make sure everything on the new drive is an exact match for what was on the old drives, before I delete the data from those to free up the space. So thank you for this! Installation was easy (ran into the same Windows Defender/Win 10 issue as everyone else, but given the reports from other users that the software was clean, I just switched it off long enough to install the program, then switched it back on again. Problem solved), and the registration info was in the readme and it registered without a hitch. Perfect timing for this. Just got a 6TB external drive and was getting ready to start copying and organizing things from my other drives onto this one. If I'm reading things correctly, it sounds like I'll be able to use this program to make sure everything on the new drive is an exact match for what was on the old drives, before I delete the data from those to free up the space. So thank you for this! Installation was easy (ran into the same Windows Defender/Win 10 issue as everyone else, but given the reports from other users that the software was clean, I just switched it off long enough to install the program, then switched it back on again. Problem solved), and the registration info was in the readme and it registered without a hitch. I would try it but seems like a money laundering scam free for limited time then 36.00 hmmm. Well there are too many free similar types of software and yours seem's nothing special except a explorer with two screens. IE FreeFileSync and midnight commander for windows there are many more. best relegate your software to foss if you really want to compete. There is indeed something strange going on with this program. It keeps trying to install something in my MS Office 2010.And I find it rather suspicious. What business do they have installing anything in Microsoft Office? Unless they are trying to inject some kind of code in there. I do not care, now, about the Virus Total's scan results. This strange behavior of the program combined with other warnings posted by other commenters make me wonder how safe this program is. I am going to uninstall it immediately. There is indeed something strange going on with this program. It keeps trying to install something in my MS Office 2010.And I find it rather suspicious. What business do they have installing anything in Microsoft Office? Unless they are trying to inject some kind of code in there. And if so, what is it? I do not care, now, about the Virus Total's scan results. This strange behavior of the program combined with other warnings posted by other commenters make me wonder how safe this program is. I am going to uninstall it immediately. I understand your hesitation/concern. In this day and age you have to be very careful about what you install on your computer. All I can do is to assure you that we are a reputable software dealer. We've been in this business since the beginning of the try-before-you-buy days. We've been highly awarded by fellow colleagues and software organizations for the quality of our software. Sadly, all of that matters not if one anti-virus software incorrectly flags your software as containing a virus. Our software is 100% free from viruses, adware, or spyware. We do nothing with your MS Office install. We do interact with Word, if you choose to view differences between Word documents. But we use your own installation of MS Word to do that, we don't install any Office components. consuella, I understand your hesitation/concern. In this day and age you have to be very careful about what you install on your computer. All I can do is to assure you that we are a reputable software dealer. We've been in this business since the beginning of the try-before-you-buy days. We've been highly awarded by fellow colleagues and software organizations for the quality of our software. Sadly, all of that matters not if one anti-virus software incorrectly flags your software as containing a virus. Our software is 100% free from viruses, adware, or spyware. We do nothing with your MS Office install. We do interact with Word, if you choose to view differences between Word documents. But we use your own installation of MS Word to do that, we don't install any Office components. I hope that this response from the developer of the software will assuage any concerns anyone reading this might have. be careful when using this with default settings as the default compare method is only file size and file data and time! So by default it does not even look at the file contents or names or file extension! It'll be quick to compare but the results are likely to be inaccurate. or pool.ntp.org for a worldwide pool of possible time servers. be careful when using this with default settings as the default compare method is only file size and file data and time! So by default it does not even look at the file contents or names or file extension! It'll be quick to compare but the results are likely to be inaccurate. Also the default time servers provided are not very reliable from outside USA, in UK go into the options time server branch and add uk.pool.ntp.org or pool.ntp.org for a worldwide pool of possible time servers. The software itself works quite well, but its very dated looks makes me suspect genuine further development is not going to happen. All the same, big thx to the GOTD team and Salty Brine. The software itself works quite well, but its very dated looks makes me suspect genuine further development is not going to happen. All the same, big thx to the GOTD team and Salty Brine. Sigrid.DE, yeah it looks dated. Its from 1993-2011 era. Pretty old and i never heard of this software before. But i believe similar programs were put up before by GOTD like Easus Folder Sync and 123 Folder Synchronization software which was also pretty old, some good 5-6 years. I have that software with me. I think i'll remove this, its kind a buggy, whenever i close the screen of that apps become dark and goes black for a few sec and then closes. That shouldn't be happening. I might remove it, thought. BUt thanks you GAOTD team, for your genuine effort. I don't use any of such tools, i don't need it. Sigrid.DE, yeah it looks dated. Its from 1993-2011 era. Pretty old and i never heard of this software before. But i believe similar programs were put up before by GOTD like Easus Folder Sync and 123 Folder Synchronization software which was also pretty old, some good 5-6 years. I have that software with me. I think i'll remove this, its kind a buggy, whenever i close the screen of that apps become dark and goes black for a few sec and then closes. That shouldn't be happening. I might remove it, thought. BUt thanks you GAOTD team, for your genuine effort. I don't use any of such tools, i don't need it. Genuine further development is indeed going to happen. In fact, it's currently happening at a feverish pace! Does anybody know what is different/new in this version, compared to 3.7.0 ? I don't need this so won't be downloading it, but after reading through the comments I have to say something. I've been trying software from GOTD for years now, YEARS, and not once have I ever seen an infected file from this place. You can beef about their offerings but you can not complain about their security! It seems like every single day and with every single offering someone's complaining about VIRUS'S/Malware. If more of you would take the 10 or 15 minutes it takes to actually research what these "virus/malware" findings ARE not only would it save you from looking silly here but you might actually LEARN something about your machines and the steps you need to take to keep it secure. I don't need this so won't be downloading it, but after reading through the comments I have to say something. I've been trying software from GOTD for years now, YEARS, and not once have I ever seen an infected file from this place. You can beef about their offerings but you can not complain about their security! It seems like every single day and with every single offering someone's complaining about VIRUS'S/Malware. If more of you would take the 10 or 15 minutes it takes to actually research what these "virus/malware" findings ARE not only would it save you from looking silly here but you might actually LEARN something about your machines and the steps you need to take to keep it secure. With Windows 7, 32bit using Comodo CIS 10 anti virus etc the zip file and setup.exe file has NO virus shown. By reading the "readme" file I installed the program in the partition of my choice and activated the program with no trouble at all. If the program loads I can't imagine how one could miss the activation procedure. Of course this helps: "When all else fails read the instructions!" (located in the; ............ "readme" file). The GUI is not "modern" but good old fashioned direct and gets the job done. I would have appreciated if the program had put a link on the desktop after the installation though. You have to go through several steps to get two folders visible to compare but the information the program presents is very good and helpful. I've been using XYplorer for may years to synch my folders so it will take a bit to get used to FoldlerMatch for matching folders etc. Each program has its own advantages for different tasks. On a quick test FolderMatch seems to be a keeper. Thank you GOTD and Salty Brine Software for this program. With Windows 7, 32bit using Comodo CIS 10 anti virus etc the zip file and setup.exe file has NO virus shown. By reading the "readme" file I installed the program in the partition of my choice and activated the program with no trouble at all. If the program loads I can't imagine how one could miss the activation procedure. Of course this helps: "When all else fails read the instructions!" (located in the; ............ "readme" file). The GUI is not "modern" but good old fashioned direct and gets the job done. I would have appreciated if the program had put a link on the desktop after the installation though. You have to go through several steps to get two folders visible to compare but the information the program presents is very good and helpful. I've been using XYplorer for may years to synch my folders so it will take a bit to get used to FoldlerMatch for matching folders etc. Each program has its own advantages for different tasks. On a quick test FolderMatch seems to be a keeper. Thank you GOTD and Salty Brine Software for this program. The setup file contains Trojan horse, please check your files before uploading. AYMAN A ALSAFWANY, it's scanning clean on all the engines on virustotal.com and there are no warnings from smartscreen here from this or the vendors site, so what is the name of the trojan you aledge is detected and what software and patterns version is making the report? Nothing I have here raises any concerns over the setup files supplied. 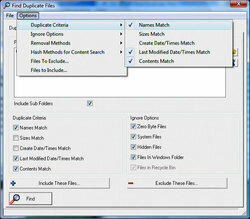 Downloaded and installed FolderMatch. No issues raised by Emsisoft Anti-Malware. I have a folder-icon-changing program. While FolderMatch copies the hidden icon and .ini files needed to change the appearance of my folders, it does NOT carry over the folder attributes. The copied folder is reverted back to it's original manila color. If I'm wrong about this and failed to check/uncheck something in the options box, someone please let me know. 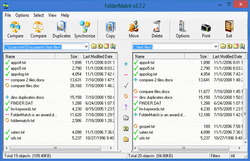 Downloaded and installed FolderMatch. No issues raised by Emsisoft Anti-Malware. I have a folder-icon-changing program. While FolderMatch copies the hidden icon and .ini files needed to change the appearance of my folders, it does NOT carry over the folder attributes. The copied folder is reverted back to it's original manila color. If I'm wrong about this and failed to check/uncheck something in the options box, someone please let me know. For Windows 10 virus problems: ISN'T A VIRUS! Just download-link from GOTD is send to virtotal. I downloaded the program on Win 10 with no problem and a trial scan seems great. In view of the virus comments I scanned both the download file and zip file in my download folder and the full program which is one on my C Drive with Norton Security and both came up all clear. Because I have bought Norton for my computer Windows Defender is automatically turned off so perhaps it is a problem with Windows Defender. Anti Virus programs seem to have strange effects. I have had a problem downloading GOTD programs for the last two years since I installed Kaspersky but since switching to Norton a few months ago they now download with no problem. I downloaded the program on Win 10 with no problem and a trial scan seems great. In view of the virus comments I scanned both the download file and zip file in my download folder and the full program which is one on my C Drive with Norton Security and both came up all clear. Because I have bought Norton for my computer Windows Defender is automatically turned off so perhaps it is a problem with Windows Defender. Anti Virus programs seem to have strange effects. I have had a problem downloading GOTD programs for the last two years since I installed Kaspersky but since switching to Norton a few months ago they now download with no problem. When a third-party AV scanner is installed in Windows, Windows Defender is automatically disabled. When a third-party AV scanner is removed in Windows, Windows Defender is enabled again. Peter, When a third-party AV scanner is installed in Windows, Windows Defender is automatically disabled. When a third-party AV scanner is removed in Windows, Windows Defender is enabled again. Same as Rubertti, it won't activate on Windows 7. Message says "The Registration Name/Registration Key combination is not valid"
It works if register when starting program, not after it started. Unable to install on Windows 10. Windows defender automatically removing the downloaded set-up file as the file contains virus. Odd. On my Windows 10 Home 64-bit machine (if that makes a difference, auto-updated with all updates "successful" at present), even when right-clicking and specifically choosing "Scan with Windows Defender..." it is not flagging the Setup.exe file at all (as extracted from the downloaded ZIP file). Also (and as mentioned elsewhere) my upload of today's Setup.exe to VirusTotal.com had 0/68 detections. Does Setup.exe initiate another download of more files that are being detected? After downloading, right-click on the saved file (whatever type it is, ZIP, EXE, etc.) and select Properties. In the Properties window that appears, on the General tab, at the bottom below "Attributes" you frequently will also see the item "Security". For files I download from this website it is almost always present. If you do see it there it will say "This file came from another computer and might be blocked to help protect this computer." This worked, thank you very much. I have been using this program for many years. I have four computers and many hard drives on which I make backups. I have to synchronize all that. The advantage of the program is the flexibility. You can decide exactly which file you keep on the original or the backup. Sometimes, you make a mistake on the original and you are able to override it by copying the backup over. It is very fast and fail safe if you understand what you are doing. I have the home license since the program is installed on four computers. That's the received message: Cannot execute "C:\Users\UU\AppData\Local\Temp\Rar$EXa12424.4370\Setup.exe" claiming that there is virus threat... Please advise. Beyond Compare has been my goto for years. With all the install issues I will stick with that. I have a license for this lovely piece of software and find it very dependable and helpful. It does everything it claims, and it does it quickly. I like the GUI like it is and hope they never change it to one of those colorless chicken scratching Win 10 looks. Win32/vigorf.a virus marked as severe on win 10. Help with this please? Once installed and registered Win 10 (successful) it tries to begin another installation involving Office 2013, which fails while asking for the Office install disk... program won't run beyond this failure. Can any one tell me how is the software compare with freefilesync? One of the things that I know of is that it cannot sync. It can find the differences/duplicates between 2 folders. You have to delete the manually delete or replace the files accordingly. 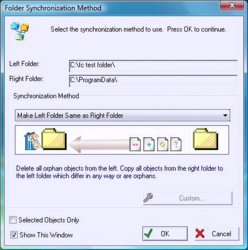 Freefilesync, can sync automatically although, in some cases, there are some mistakes during comparison. You can, possibly, delete/replace the wrong files. Anyway, it seems Freefilesync is better than Foldermatch in this sense. Is there any advantage by using this app? But, according to virus total check, Freefilesync is not as clean as this one is. So I'd rather stay away from Freefilesync. PM Karaoke, But, according to virus total check, Freefilesync is not as clean as this one is. So I'd rather stay away from Freefilesync. "An error occurred while trying to replace the existing file: DeleFile failed code 5, Access is denied. "Click Retry to try again, Inore to skip this file (not recommended) or Abort to cancel installation. on Win 10 Pro 64bit when attempting to install: got this error message "C:\WINDOWS\system32\RICHTX32.OCX "An error occurred while trying to replace the existing file: DeleFile failed code 5, Access is denied. "Click Retry to try again, Inore to skip this file (not recommended) or Abort to cancel installation. Try this..........Hit the windows key +R at the same time. Now type regsvr32 RICHTX32.OCX. This will register that file which is normally in the C:/windows/system32 directory. Harold, Try this..........Hit the windows key +R at the same time. Now type regsvr32 RICHTX32.OCX. This will register that file which is normally in the C:/windows/system32 directory. xCurt, did you use smartscreen from MS? I am getting antivirus warnings when trying to install using the included setup.exe or when downloading either the install exe or zip from the publisher's website. I have never gotten antivirus warnings on GAOTD stuff before (using Windows Defender). I realize this is most likely a false positive, but it's a hard pass from me. Sorry GAOTD, I was looking forward to trying this out. What does this do, that "Right click, send to" doesn't do...Not being argumentative. Just want to know.. I have used a competitor for some time and can't live without it. I'm going to try this one and see how it compares and if I like it better. Yes but can it sync folders on my desktop computers with similar folders on my NAS storage? Chris Kelly, I have downloaded the software and my NAS drive plus my external drives come up on the comparison window so it should work although I haven't actually tried it yet. Can't activate: "The Registration Name/Registration Key combination is not valid"
I use for years the basic free ViceVersa. (ver 1 I think). This GODT looks very promising, a keeper! I also like the old look, it's clear and not cluttered. Installed and indeed nice GOTD, I use for years the basic free ViceVersa. (ver 1 I think). This GODT looks very promising, a keeper! I also like the old look, it's clear and not cluttered. The best comparison software ever on Windows platforms! If you burn a DVD/BR, before deleting data from HDD, it's mandatory first to use FolderMatch to verify the correct data writing. Thanks for giveaway of this fantastic piece of software!! !